What shapes the rewards and information that plants provide to their pollinators? In many plant species, different flowers differ greatly in how much nectar or pollen they provide to visitors. Relatively little is known about the costs and benefits of this variability: it may be a way of tricking pollinators, allowing plants to reduce average rewards without losing attractiveness, and it may have other benefits. To make matters more complicated, many of the plant species with variable rewards provide cues that tell the pollinators which flowers are more rewarding and which are less rewarding. We are curious about the costs and benefits of producing flowers with variable rewards and of providing information about those rewards to pollinators. How do plants influence one another’s pollination? Plants can help or harm each other through their effects on shared pollinators: they may help each other attract and support pollinators, but they can also draw pollinators away from each other. When pollinators travel frequently between plant species, both species are likely to suffer because the pollinators are delivering the wrong pollen and carrying each plant’s pollen to the wrong species. These interactions have important consequences. 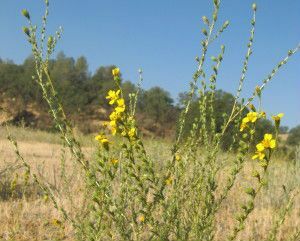 For instance, invasive plant species can have strong, negative effects on the pollination of native plants, but in some cases, they may have positive effects instead. In agriculture, planting wildflowers near fields has the potential to increase crop pollination by attracting and supporting pollinators, but wildflowers could also draw pollinators away from crops. A decrease in flower density within a plant species can reduce its attractiveness to pollinators, raising its chance of extinction. Our work explores when plants are likely to benefit each other’s pollination and when they are likely to harm each other.